I'm not aiming this post at anyone in particular but I'm sure it'll touch a few nerves and I'm quite prepared for my number of followers to drop rapidly as a result. The most annoying thing that movie bloggers do is to retell the story instead of writing a review. For God's sake, if I wanted to just read the plot outline, I could just go over to IMDb or Amazon where I quote the one or two sentences I need for a synopsis at the beginning of my own reviews anyway. Didn't any of you learn in school that writing a critique is not about just writing the story out again in your own words? Seriously, people, get a grip. The review should be about parts of the movie which stood out or how it affected you on a personal level. The bottom line is that I want to know if the film was any good or not. The second equally annoying thing is people who pick arguments on other people's blogs. If you want to argue with me about my opinion or review of a film then bring it right here to my blog and don't try to flame me somewhere else. I'll defend my opinion to the hilt, since it's MY OPINION. You might very well like crap, badly made films but I don't so if you think you can defend utter rubbish then write your own blog about it. If you can't back up your arguments with even a bare minimum of Aristotelian criteria then just shut up. Since I've been on Blogger, I've only had three very negative comments (only two of which were on my blog itself). I deleted the obviously trolling ones straight away of course. The best thing about Google's Blogger service is that it's so difficult to leave comments anyway that trolls rarely return when you just delete their posts with one click after all the effort they must have gone through to write them. "Like I care, dumbass. I've never been interested in your tasteless blog anyway. Your reviews are always hollow and full of cliches, but hey what could I expect from a moron like you, who's opinion depends on critic's feedback. Piss off, loser." For anyone who is thinking of starting yet another blog war with me, remember these things. I don't get paid to write my blog, I do it as a hobby so I'm going to keep on doing it whether you like what I have to say or not. I've also been watching and writing about horror movies for considerably longer than a lot of people you will see online so when I say that a movie is crap, you can believe me. I don't write reviews to curry favour with the filmmakers (or other critics), that's for damn sure. 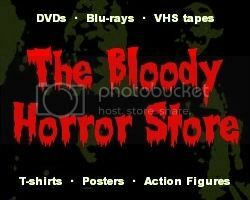 The purpose of "Dr Blood's Video Vault" has always been to help you avoid wasting your time and money on the slew of bad horror movies that flood the market. That isn't just down to my personal taste but is based on objectivity. Just because I choose to make some of my reviews more humourous than others does not mean that I haven't carefully considered the final verdict based on a load of factors that don't make very entertaining reading in the first place. If you've read this far and decide to keep following my blog then good on you. I'm going to increase my output over the Summer months to finally catch up with my original "Video Vault" recommendations and create a lot more interactive content here and there. I know some of my reviews are a bit superficial but then so are the films that I'm reviewing. I'm dealing with the most derivative genre of movies possible and rarely encounter any masterpieces. I have always preferred horror movies though and will continue to do so. If you feel the same way then follow this blog if you haven't already. Things are going to get even bloodier!